Although we’re an ocean and several time zones away, it’s impossible to walk past a magazine rack here in America without spotting the youngest male member of the British Royal Family on the cover of a magazine. The esteemed Prince George of Cambridge is the third in line to succeed his paternal great-grandmother, Queen Elizabeth, following his grandfather Prince Charles and his father, Prince William, who is also a Montessori school alumni. In December, the little Prince attended his first day of preschool at Westacre Montessori School in Norfolk, England, a quaint converted church in the countryside near the Royal Family’s Sandringham estate. With a new backpack and wide-eyed curiosity, Prince George captured the world’s attention with his eagerness to learn in the Montessori tradition. Although Prince George’s first day of school has caused quite the media frenzy, his education is also responsible for what some are now calling the “Montessori Effect”. Louise Livingston, Director of Training at the Maria Montessori Institute, has reported a dramatic 65 percent uptick in interested families at the school, and a 45 percent boost in new teacher interest, compared to the same time period just one year ago. This year marked Prince George’s first taste of life in the Montessori classroom. So what can the Royal Family expect Prince George to learn? On the first day at a Montessori preschool, children are introduced to a new environment that feels a little bit different than home – but one that’s still warm and inviting. Teachers will likely greet each student by first name, communicating respect for the child as an individual and instantly opening the lines of communication between teacher and student. Teachers may show students where to put their belongings, gather everyone for a morning song, or simply let students explore their new surroundings while gently guiding them through any activities they gravitate towards. At this stage, independence and self-confidence are the most important skills that Prince George will acquire. Learning how to zip his coat, take off his shoes, wash his hands, and put away his activities are all great introductory activities that Montessori children will be exposed. The goal at this age isn’t to set children “loose” in the classroom, but rather to help them find daily rhythms, habits, and rituals that set the pace for everyday learning. As Prince George continues to become acclimated to the Montessori classroom and gain independence, he’ll also be gaining dexterity in his hands. In our Children’s House, for example, teachers typically guide children through a range of activities that build strength in the hands so that they can, in a few years’ time, use writing instruments and begin lettering or cursive. As young Montessori students fine tune their motor skills, they also experience a remarkable boost in their independence, an understanding of personal space, and a great sense of pride that motivates students to carry out tasks with order and accomplishment. During early childhood, many young learners have not yet experienced a formal group setting beyond small playdates or family gatherings. Although Prince George may already be used to large crowds and events, he and his peers are still in an age group where they’re grasping social norms, rules, and values. The unique activities that Montessori teachers guide students through are designed to help children learn from experience and learn by example. For instance, group activities may demonstrate to children how to share, wait your turn, or learn about different cultures, ultimately inspiring respect from an early age. Most children are familiar with about 100 words at Prince George’s age. He and his peers are sponges for new vocabulary and often learn by taking cues from parents and teachers. At this stage, Montessori children will learn many new words by looking at pictures and naming what they say. Basic nouns like “dog”, “tree”, “cow”, and “car” are just some of the new words that children will be introduced to. Each day, students will be exposed to new activities that will allow to grasp visual cues, vocabulary, and concepts in an effort to build this “verbal muscle”. Headline: The beauty of a Montessori education is that there is a systematic – yet flexible – approach to everything that happens in the classroom. If we can prepare the body physically and the mind mentally for what’s to come, then things like academics, attention span, and dexterity will come naturally in time. 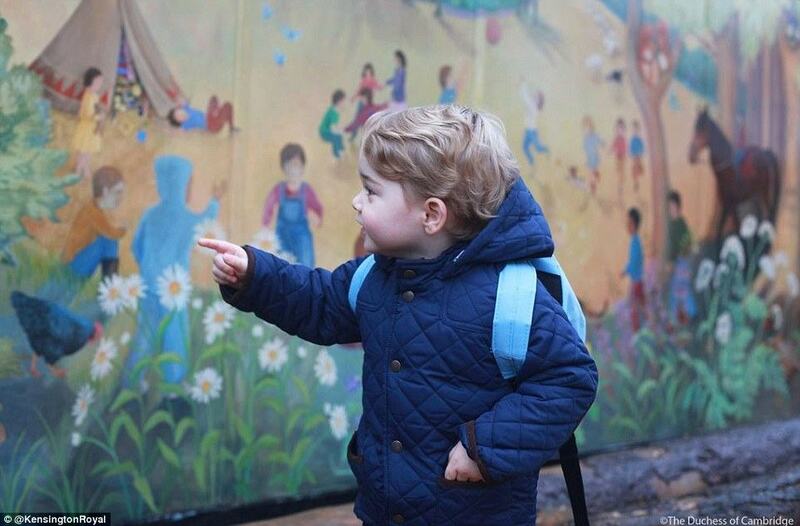 For Prince George, a young man with much responsibility to bear early on, a Montessori is the ideal early education. Being exposed to a culture of respect, learning to be accountable for actions, and embracing differences will prepare the Prince for an extraordinary life of leadership and royal conduct. Prince George’s world is his oyster, and his Montessori education will continue to play an exciting role in the future of Britain’s monarchy. Explore our Children’s House program and see how students thrive at Chesapeake Montessori School. Sign up for a family tour today!